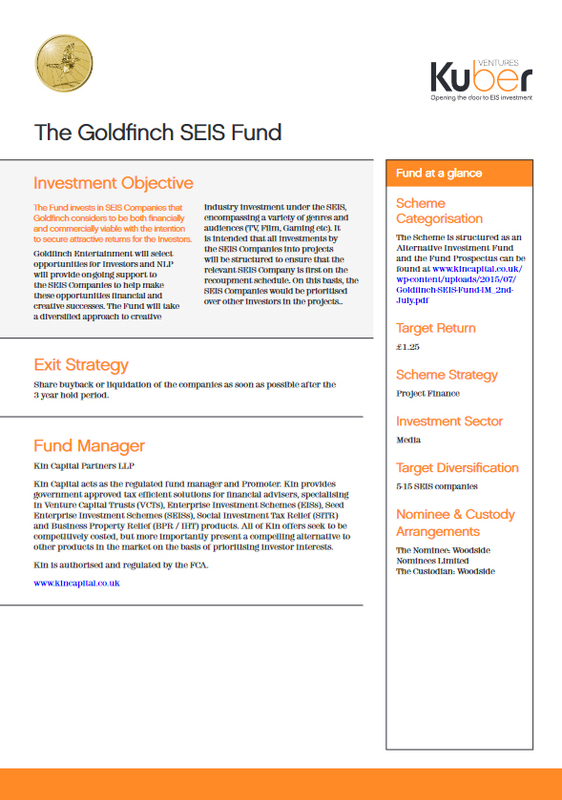 The Fund invests in SEIS Companies that Goldfinch considers to be both financially and commercially viable with the intention to secure attractive returns for the Investors. Goldfinch Entertainment will select opportunities for Investors and NLP will provide on-going support to the SEIS Companies to help make these opportunities financial and creative successes. The Fund will take a diversified approach to creative industry investment under the SEIS, encompassing a variety of genres and audiences (TV, Film, Gaming etc). 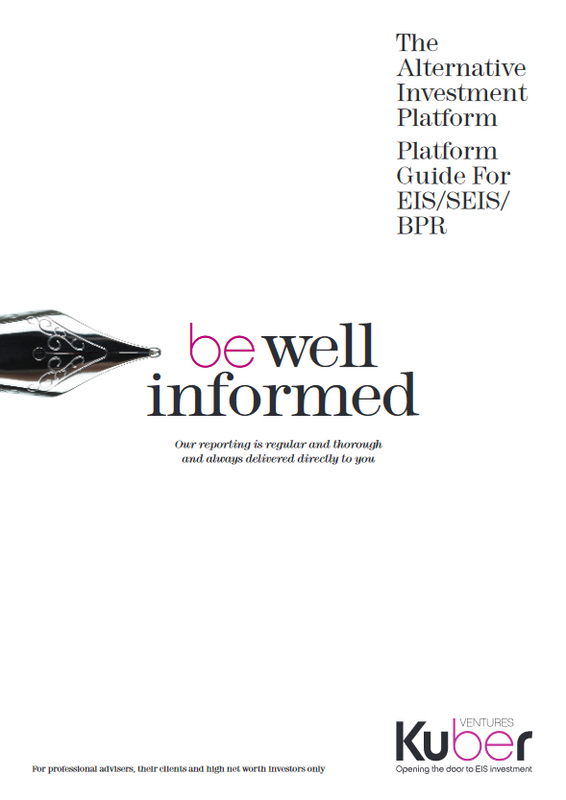 It is intended that all investments by the SEIS Companies into projects will be structured to ensure that the relevant SEIS Company is first on the recoupment schedule. On this basis, the SEIS Companies would be prioritised over other investors in the projects. Share buyback or liquidation of the companies as soon as possible after the 3 year hold period. Kin Capital acts as the regulated fund manager and Promoter. 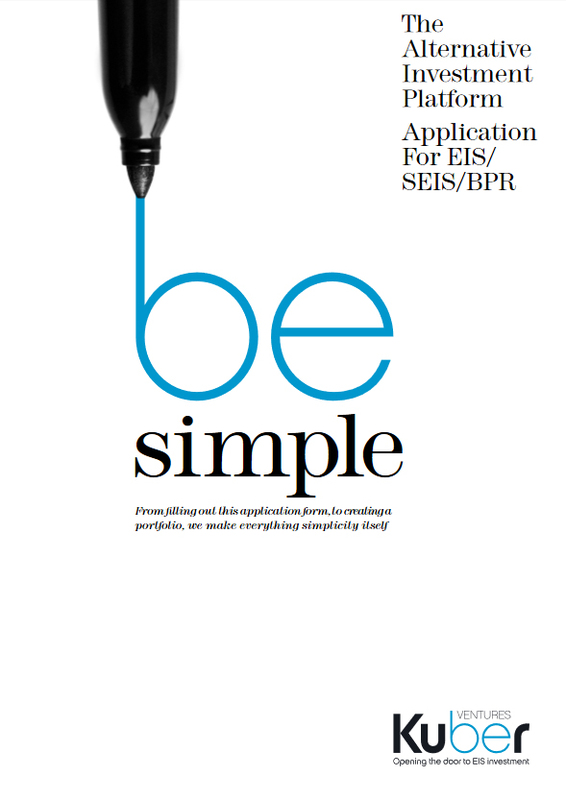 Kin provides government approved tax efficient solutions for financial advisers, specialising in Venture Capital Trusts (VCTs), Enterprise Investment Schemes (EISs), Seed Enterprise Investment Schemes (SEISs), Social Investment Tax Relief (SITR) and Business Property Relief (BPR / IHT) products. All of Kin offers seek to be competitively costed, but more importantly present a compelling alternative to other products in the market on the basis of prioritising investor interests. Kin is authorised and regulated by the FCA. Our Team includes industry leading personnel who have developed an enviable reputation for Goldfinch in the Entertainment and Investment sectors. We adopt an Executive Producer role on each project offering SEIS, EIS, GAP, Offshore funding together with consultancy services to nurture ideas from inception and to maximise their revenues. 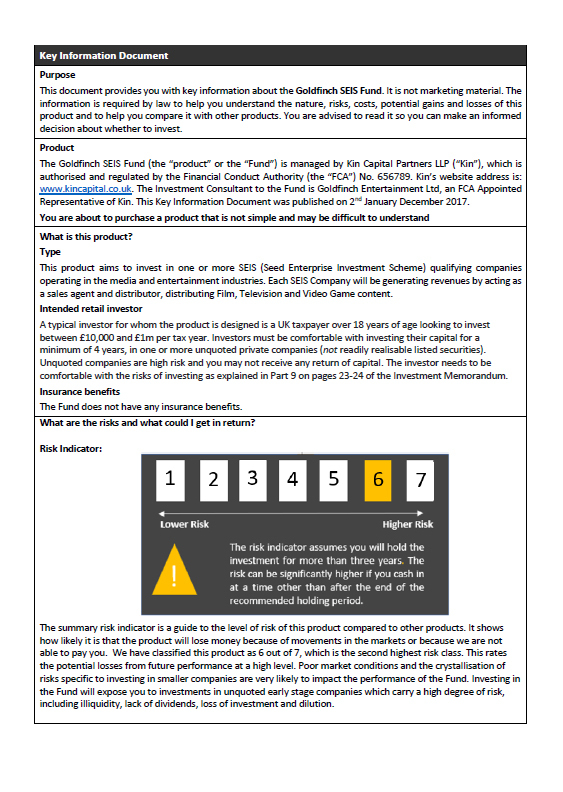 3.5%* *Fixed fee of £500 on investments of £10,000 and above. 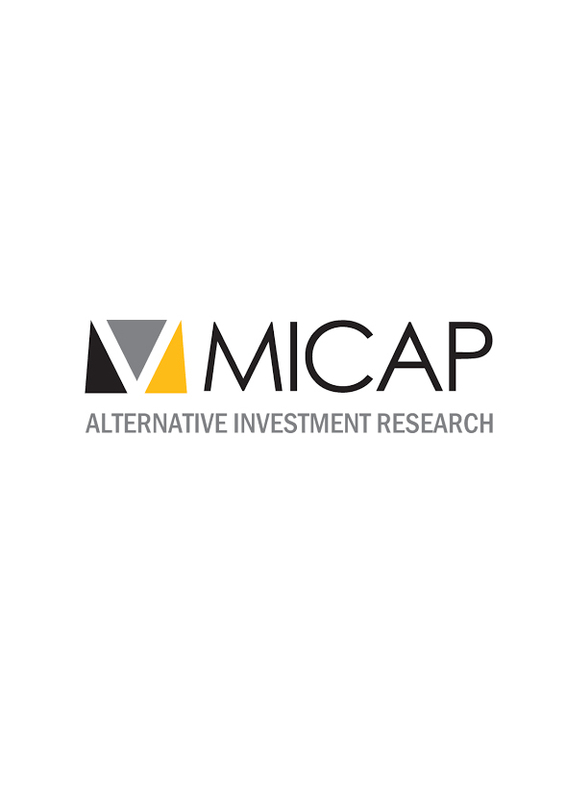 Fee of 5% on investments up to £10,000; charged to investors. capped at 0.5% charged to investee companies, capped at 4 years.